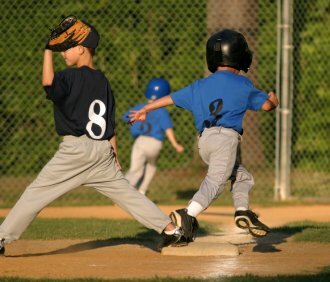 Unless your team is well advanced, the following three tee ball drills are about all you should attempt with tee ball players. Anything more and you will beat your head against a wall. You might have a couple of players who can actually throw and catch. 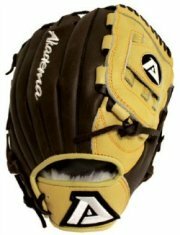 If so, try to pair them up when playing catch, and in a game play them at the pitcher and first baseman positions. The first of the three tee ball drills is the one I describe as "playing catch". At this age it is more like "playing chase". One player throws the ball and the other player chases it. Do not get hung up on trying to have them master playing catch. Tee ball is the right age to introduce them to playing catch, but they are a few years from being able to do it. Walk among your players while they are playing catch. While talking to them, observe how they are doing. You might try to lend some words of encouragement where needed. Or make corrections as you see fit. About ten or fifteen minutes of playing catch will be enough. The next two tee ball drills I would try and run at the same time. The more kids you have doing a drill, rather than waiting for their turn, the more successful your practices will be. One drill is hitting and the other is running the bases. 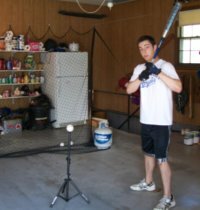 Prior to practice you should pick one or two assistants to run the hitting drill. They can set up and hit in the outfield. Go ahead and use two tees if you have them. If you have two, send a group of four to do this drill. If you only have one tee, I would send a group of two or three. In the beginning a big emphasis should be on not throwing the bat. A few kids will swing the bat and then let it fly. Many leagues will call the batter out for doing this, and with good reason. Throwing the bat cannot be allowed. 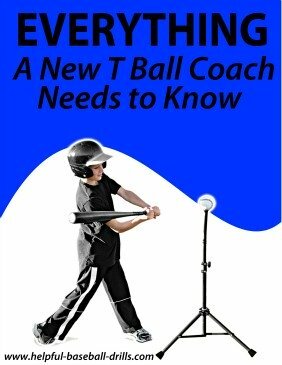 Teach the players to swing, and then lay the bat down before doing anything else. Don’t let them take one step without setting the bat down. The other training that should be done with hitting is checking the placement of their hands. Right handed batters should have the left hand on the bottom. And both hands should be touching. And try to get them to swing level and thru the ball. Some players will look like they are bunting the ball. Tell them it is OK to swing hard. That is probably the only things you can teach at this age. The last of the tee ball drills is running the bases. 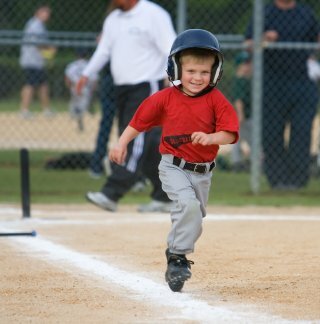 At my first tee ball practice I was shocked that kids did not know how to run the bases. Start the drill with a helping parent or two at home plate, you (the coach) at first base, another parent at second base and one at third base. The parents at home will have the kids stand in the batter box. Then, when the parent says “Play Ball”, they will swing an imaginary bat, lay the imaginary bat down and run to first. You will be at first and encouraging them to run hard and get to first. For the first few practices you should only work on one base at a time. Later on you can work on advancing past first on their hit. I would place them there the first few practices. It takes a while for most of the kids to figure out where to go on the bases. So you can use this drill at every practice. I believe most teams will need to work on this drill all season. So there you have it, the three tee ball drills to run at every practice. Kids at this age like a routine and after a few practices they will enjoy knowing what drills will be done at practice. You might think they would get bored with these drills, but that is not the case. Just keep everything positive and you will do fine.